Jeppe is working through his many books on salt. Books, articles and papers that he collected from around the world on his many travels. Some were brought to him by travelers from other countries. He seems to know someone involved in the study of chemistry, microbiology or meat science at every major university in the world. He knows a lot about salt. He has visited many of the great salt mines, from Poland to America and it seems as if, everything in between. He has been to salt works in German West Africa to our north. He knows Martin’s dad well and even though he has never met Livingston personally, he has been to some of the salt pans that Livingston talks about. On the one hand the world is big and on the other hand it is remarkably small. Salt had two key functions in antiquity. One was taste. Exquisite salts were created by artisan salt makers whose trade has been handed down over thousands of years. Each region produce salts as unique to that region as the different wines from Spain or Italy. This is to me the supreme function of salt since it is what we love! Witsand by Misty Cliffs on the Cape peninsular where our story is unfolding. Taken around 1949 by Granny Frick. The second function of salt is to preserve. It is said to be prophylactic. It guards against infection and spoilage. Salt is a crystal that contains many elements, but as a matter of practicality and due to the widespread application of sodium chloride in industry, ended up being produced around the world with only these two elements. Both atoms consist of a nucleus with a positive electric charge – an island floating in a sea of electrons which are negatively charged particles. If one brings together one atom of both of these elements, the chlorine atom steals an electron from the sodium atom: the first becomes a negatively charged chlorine atom and the second is transferred into a positively charged sodium atom. 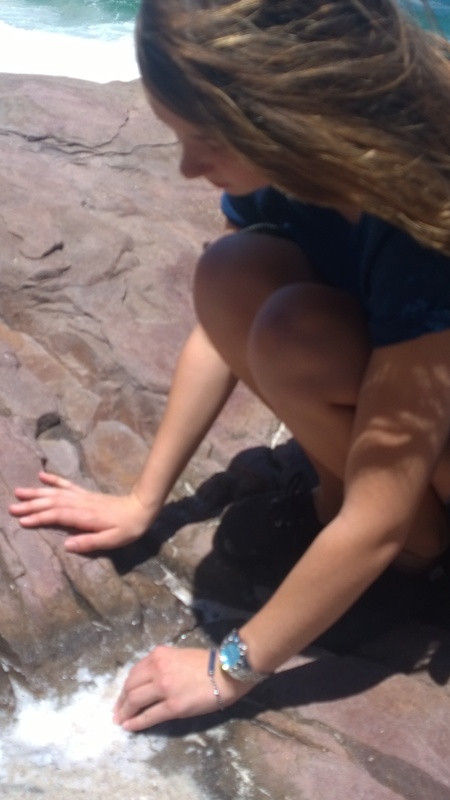 Lauren, my daughter, investigating salt crystals that form on rocks at the Cape of Good Hope where in the summer temperatures rise to above 35 deg C. During low tide water evaporates, leaving pockets of salt dotted across the rock sheets. Salt has a major preserving influence on meat. There must be some interaction between the salt and the microorganisms and it can’t always be negative for the bacteria. If this was the case, how would the bacteria responsible for changing the nitrate into nitrite from Dr Ed Polenski’s experiments survive and how would the microorganisms in the ocean deal with different levels of salinity. Salinity refers to water that contains various concentration levels of salt. The magic of salt happens when it comes into contact with water. When one adds a spoon full of salt to a glass of water, the salt “melts” into the water. When we evaporate the water, the salt forms a crystal. The sodium and chlorine ions are now separated in the water and have vastly different functions in meat. This is important. Not just from the perspective of what happens inside meat, but what happens in the environment where the meat is being processed. Endospores are present in soil and any transfer of soil into a processing area can bring about the transfer of bacteria into the meat processing area. In our time this is a major problem related to home curing of bacon. An endospore is “a dormant, tough, and non-reproductive structure produced by certain bacteria. The name “endospore” is suggestive of a spore or seed-like form (endo means within), but it is not a true spore (i.e., not an offspring). “It is a stripped-down, dormant form to which the bacterium can reduce itself. Endospore formation is usually triggered by a lack of nutrients. In endospore formation, the bacterium divides within its cell wall. One side then engulfs the other. Endospores enable bacteria to lie dormant for extended periods, even centuries. Revival of spores millions of years old has been claimed. When the environment becomes more favourable, the endospore can reactivate itself to the vegetative state. Most types of bacteria cannot change to the endospore form. Examples of bacteria that can form endospores include Bacillus and Clostridium. Clostridium botulinum is an important pathogen. It forms endospores that can survive almost anything. Remember that salt has little effect on removing this pathogen from an environment. It also survives without water. Between 1817 and 1822, Justinus Kerner was the medical officer in southern Germany, in Württemberg. He had seen many people with symptoms of impaired breathing, difficulty in speaking, swallowing and seeing double. Kerner suspected that some type of biological poison related to eating sausages caused the symptoms. He investigated what the people ate and found that all of them ate sausages that were not properly cooked. Salt “extracts” moisture from the meat by the water migrating out of the muscle towards the salt in an attempt to “balance” the salt levels on the outside of the meat with the inside. Salt at the same time “migrates” into the muscle. Once inside the muscle, the salt now poses a threat to bacteria found inside the meat through the process of osmosis. Osmosis is the passage of solvent through a semipermeable membrane in response to different concentrations of solute on the two sides of the membrane. The description comes from the notion that salt or sugar attracts water when it touches the meat. 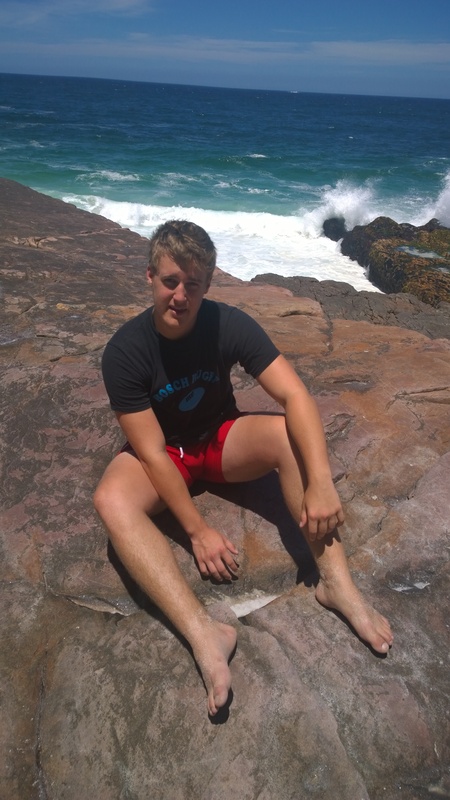 My son, Tristan, investigating the same salt deposits that his sister has been looking at. Most bacteria will not grow at 3% concentration levels of sodium chloride (NaCl). It is important to remember that there are a number of important exceptions to this rule. Some bacteria and archaea (a single cell organism) called halophiles (from the Greek word salt-loving) require NaCl to grow. Moderate halophiles, such as marine bacteria, may show optimum growth at 3% NaCl. They require at least 1.5%. Some bacteria has been found growing in 25% NaCl concentrations. However, most bacteria stop growing at 3% NaCl. This, besides the lack of available water, is the only other way that salt performs its magic as a preservative for meat. There are other advantages of using salt which becomes clear when one uses wet curing brine as opposed to dry cure. Wet curing has been used as a technique of curing pork for hundreds of years. There is a notable description of this process that Jeppe showed me from a historical American document. In May, 1804, an expedition departed from near St Louis on the Mississippi River, planning to make their way westward, through the continental divide to the Pacific coast. The expedition was known as the Lewis and Clark Expedition or the Corps of Discovery. It was the first American expedition to cross what is now the western portion of the United Sates. The expedition was commissioned by the man who wrote the Declaration of Independence, President Thomas Jefferson shortly after the Louisiana Purchase from the French in 1803 for $15 million. This transaction added a territory to the United States that stretched “from the Mississippi to the Rocky Mountains and from Canada in the North to the Gulf of Mexico in the South.” (Wulf, A., 2015: 121-122) It consisted of a select group of U.S. Army volunteers under the command of Captain Meriwether Lewis and his close friend Second Lieutenant William Clark and was the first overland journey across the whole of the North American continent. The journey lasted from May 1804 to September 1806. The primary objective was to explore and map the newly acquired territory, find a practical route across the Western half of the continent, and establish an American presence in this territory before Britain and other European powers tried to claim it. 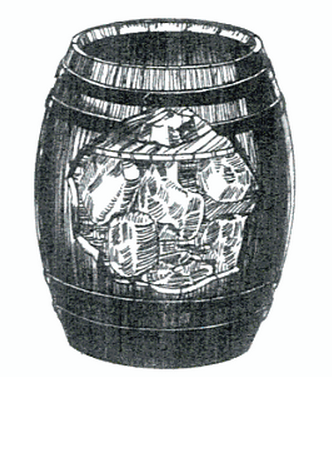 On 3 April 1804, Clark described how pork was being packed and cured in barrels. He wrote on 17 April that they “completed packing 50 kegs of pork and rolled and filled them with brine”. It is clear that they were not using a dry salt preparation but rather a water-diluted salt mixture and perhaps adding sugar or adding flavourings that would make it taste better than and not as harsh as straight salting. They would have used good kegs as leaking kegs were often responsible for meat spoiling. It went well and a month after Clark’s pork went into the barrels, Major Rumsey inspected it and condemned only approximately 10% of the meat. A curing method for pork that was documented in 1776 shows that wet curing must have been practiced for many years before Clark’s description in 1804. The account of Clark is intriguing. If he left the pork for two weeks in the brine, he must have noticed that he took out heavier pieces of meat than he put in when the wet cure method was used. He then describes how an animal is killed in the usual way, the chest opened and a metal pipe connected to the arterial system. Brine was pumped through gravity feed throughout the animal. Approximately 6 gallons were flushed through the system. Pressure was created to ensure that it was flushed into the small capillaries. Smith reported overall good results from the process with a few exceptions. An interesting note that we must return to later was the common use of monophosphoric acid, probably as an added preservative. When muscle is left in brine, the brine seeps into the meat. By the mid 1800’s, the use of wet cute has evolved to include some form of injection. A process that would have further added the likelihood of water to have been retained in the muscle tissue. Johann Fey’s patent number US474446 A. The issue of water holding capacity of curing brine’s slowly but surely stared to come to the fore from the mid 1800’s even though it has certainly been a consideration in the meat industry for many years despite the lack of documentary evidence. This brings us to the next very important function of salt. Salt increase the water holding capacity of meat. Remember that we have said that salt exist in water as sodium (Na+) and chloride (Cl-) ions. We will see how the different ions have different functions in curing, starting with the aid to the water holding capacity of the meat. “It is the irons that are responsible for this preserving action. An ionic strength of 0.5 or more will cause myofibrils (4) to swell and disintegrate, depolymerizing myosin filaments (threads), and solubilize the myofibrillar protein. A salt concentration of 2% or more in most meat formulations will achieve the necessary ionic strength. However, even at lower concentrations such as 0.5 – 1.0% as used for many moisture-enhanced fresh meats, the Cl – ion from salt will interact with meat proteins to increase the negative electrical charge on the proteins and increase the water-binding properties of the meat mixture. In my previous letter, I have discussed the importance of the taste of the salt. It is the sodium ion that is responsible for the salty taste in salt. The sodium ion not only gives sodium chloride its salty taste, but it is also responsible for a heightened intensity of all others flavours. Despite extensive research, no alternative to sodium has been found. It is important to note that other minerals and metals present in natural salt deposits alter the taste of salt slightly so that salt becomes the most important curing agent in pork. It is possible for the Woodys team to produce a bacon, as unique as the Marula fruit to the great African land. In the bacon that we produce, we can capture the spirit of the Bushman and the winds that blow across the vast salt pans of Betuanaland. 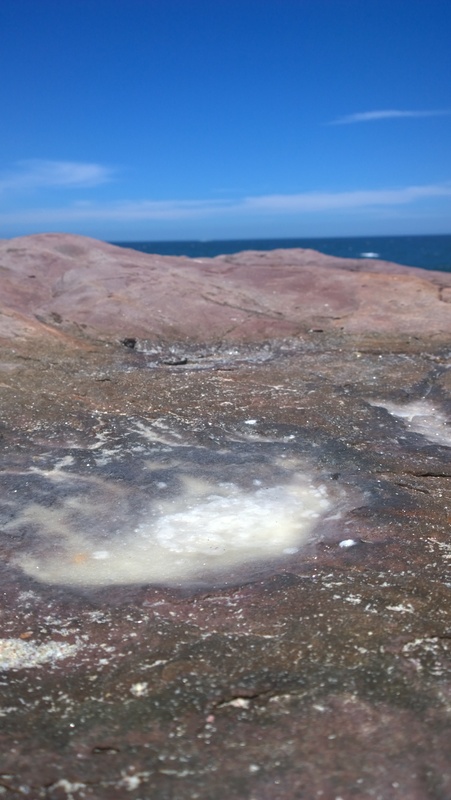 Salt crystals that form on rocks at the Cape of Good Hope where in the summer temperatures rise to above 35 deg C. During low tide water evaporates, leaving pockets of salt dotted across the rock sheets. I intend discussing these matters with David Graaff when he visits Denmark in a few weeks time. More importantly, I will be discussing this matter with Oscar and the Woody’s team. Selecting the right salt will be one of the most important choices we can make in designing our bacon. Its almost Christmas. I miss the mountains and the winds of the Cape. I miss you all dearly! Send my regards to all! Where P is the vapor pressure of the solution and Po is the vapor pressure of the solvent (usually water). What is the effect of other ingredients on Aw? So many great discoveries still ahead! (2) In 1895, Emile van Emergem, professor of bacteriology at the university of Ghent, in Belgium, identified the microorganism causing sausage poisoning as Clostridium botulinum. In 1897 there was a botulinum outbreak after a funeral dinner where smoked ham was served as the main course. Emile was called to find the cause. 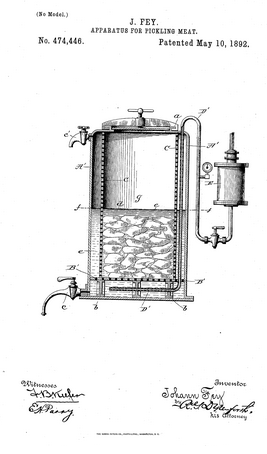 (3) John patented his device in 1892. (4) “A myofibril (also known as a muscle fibril) is a basic rod-like unit of a muscle. Muscles are composed of tubular cells calledmyocytes, also known as muscle fibers, and these cells in turn contain many chains of myofibrils. They are created during embryo development in a process known as myogenesis. Myofibrils are composed of long proteins such as actin, myosin, and titin, and other proteins that hold them together. These proteins are organized into thin filaments and thick filaments, which repeat along the length of the myofibril in sections calledsarcomeres. 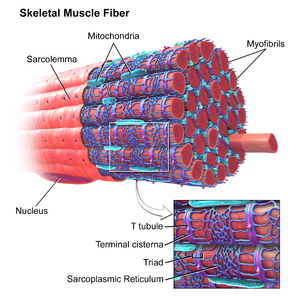 Muscles contract by sliding the thin (actin) and thick (myosin) filaments along each other. Bittreman, M. 2010. Salted. Ten Speed Press. Bud, R and Warner, DJ. 1998. Instruments of science. The science museum, London and the National Museum of American History. Dworkin, M et al. 2006. The Prokaryotes: Vol. 1: Symbiotic Associations, Biotechnology, Applied Microbiology. Springer Science and Media, Inc.
Emmeluth, D . 2010. Botulism. Infobase Publishing. Holland, LZ. 2003. Feasting and Fasting with Lewis & Clark: A Food and Social History of the early 1800’s. Old Yellowstone Publishing, Inc.
* Jay, JM, et al. 2005. Modern Food Microbiology. Springer Science + Business Media, Inc.
Laszlo, P. 1998. Salt, Grain of Life. Columbia University Press. Smith, Edwards. 1873. Foods. Henry S King and Co.
Stringer, R and Johnston, P. 2001. Chlorine and the environment, An Overview of the Chlorine Industry. Kluwer Academic Publishers. *Srivastava, S. 2003. Understanding Bacteria. Kluwer Academic Publishers. Tarte, R, et al. 2009. Ingredients in Meat products. Springer Science + Business Media, LLC. Wulf, A. 2015. The Invention of Nature: The Adventures of Alexander von Humboldt, the Lost Hero of Science. John Murray. Two very interesting aspects of this post. 1. The 1st picture was taken at the same place where the cover picture for this blog was taken. The one in 2012 or 2013 and the other in 1949. It was a complete coincidence that I included it. I did not realize where it was taken. I just liked the image when I found it and it related back to the Cape of Good Hope that in the story, I miss and where I currently live. 2. Is Mr Morgan that Edward Smith talks about in 1854 the same person that Yeats describes in 1871 as Professor Morgan, from Dublin, 17 years later? Probably. I am not sure if the methods described are exactly the same. Chances are that Mr. Morgan became Dr and Professor Morgan and that he refined his techniques. The method of injection through the arterial system is one that is still practiced at select butcheries in Germany in 2014. 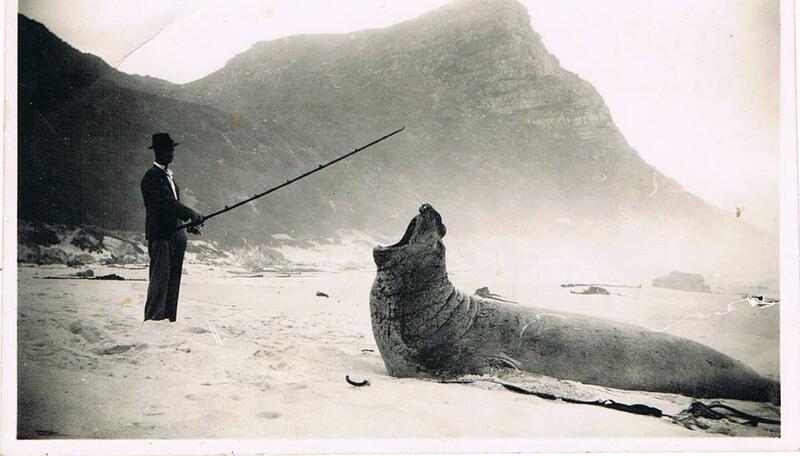 There is even a butcher in Cape Town who still use this method.